We've already talked about my weakness for buffalo wings, but we haven't discussed that boneless wings are like Kryptonite to me! I can't get enough of them! Chicken fingers are enough for an entree for me, but the guilt from all the calories always leaves me making other choices. Today, I came up with a solution. 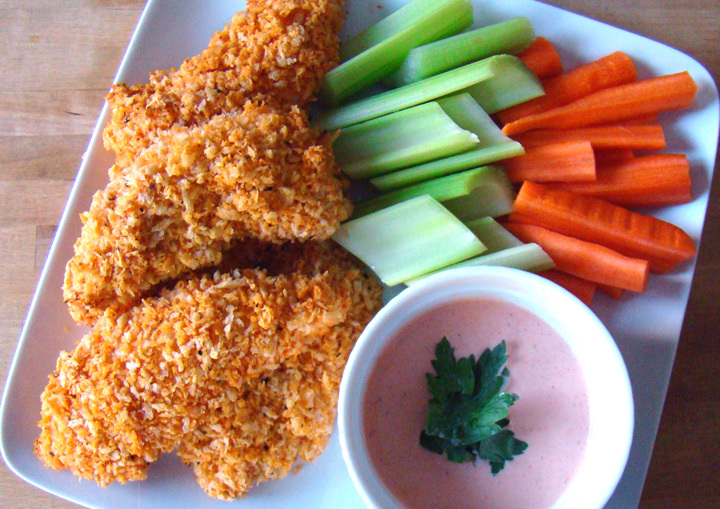 A beautiful, healthy, spicy, crispy solution. If I could only speak four words for the rest of my life, Baked Buffalo Chicken Tenders would do me just fine! Frank's RedHot Sauce was a big help today (I love their 5 second radio commercial! 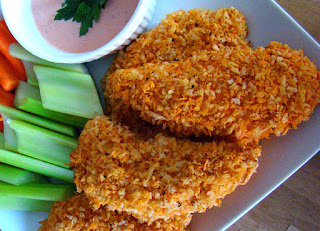 ), and with some Panko bread crumbs and lots of Light Ranch Dressing, I was a full and happy camper after our appetizers were devoured. 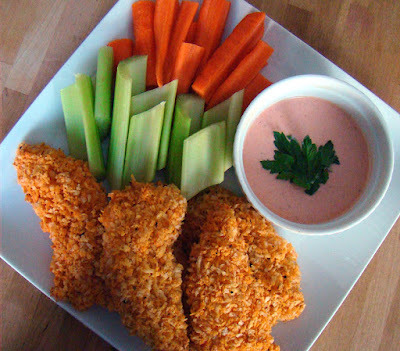 If you LOVE boneless buffalo wings, YOU NEED THIS RECIPE! In a second mixing bow, combine the bread crumbs, garlic powder and 2 tbsp. RedHot Sauce. Season with salt and pepper and stir until combined. Transfer to the third plate.